Gluten-free, grain-free and delicious! These GBX SeedFiber Brownie Bites are perfect for any occasion — from lunchtime snacks to party deserts. 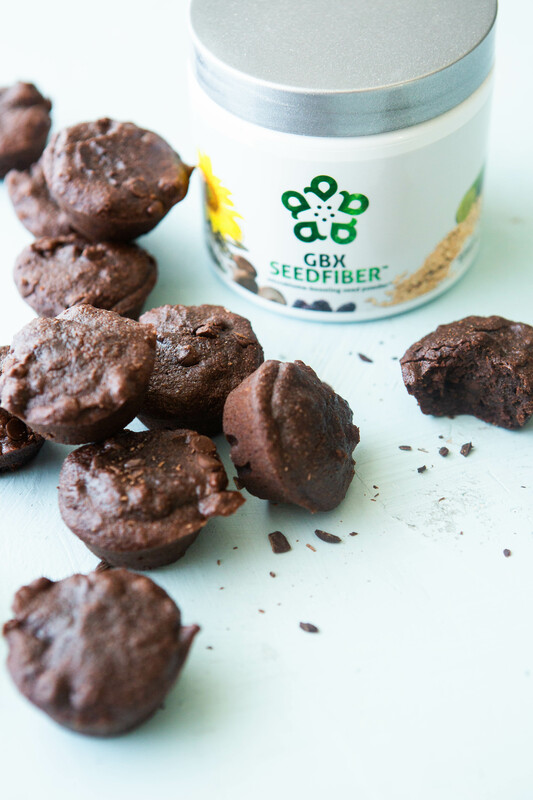 GBX SeedFiber, with it’s natural microfiber-boosting fibers, makes these chocolate bites not only tasty but also filling. If desired, add up to 8 scoops of SeedFiber to the batter before baking. -Heat oven to 350°F. Spray a nonstick mini muffin tin with coconut oil. Dust with 2 Tbsp of cocoa powder. -In a large bowl, mix together 1/2 cup of cocoa powder, almond flour, baking powder, coconut oil, eggs, honey or stevia, vanilla extract and GBX SeedFiber. Stir until well mixed, fold in chocolate chips. -Spoon batter into prepared mini muffin tin. -Bake for 13-15 minutes, or just until center of brownies springs back when touched lightly. -Remove from oven, cool slightly before gently twisting brownies from pan.